This recipe is adapted from Cuisinart's Simple Vanilla Ice Cream. In a large bowl or giant measuring cup, mix 1 1/8 cup sugar, 1/2 teaspoon fine sea salt, 2 Tablespoons sweet sorghum syrup, and 1 1/2 cups whole milk until the sugar is (mostly) dissolved. A large whisk works well for this step and the next one. Add 3 cups cream, 2 Tablespoons vanilla extract, and 2 Tablespoons cinnamon. Stir thoroughly. Freeze for at least two hours before serving. Eight hours is even better. Enjoy! 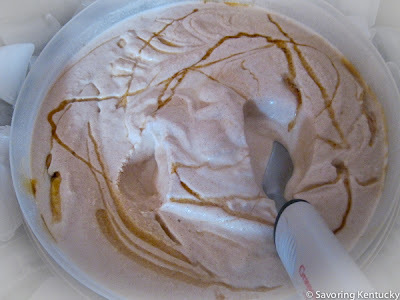 Kids can easily help make this ice cream, and they will enjoy it even more if they are the chefs. Making myself some sorghum-buttermilk ice cream tonight... came across this while looking for inspiration... great minds think alike! Beth (aka my personal blogging and food writing/inventing hero!) -- I didn't stick with this recipe and get it more perfected. It was scrumptious, but I wanted more oomph from the sorghum swirl and didn't know how to get it. I await your wonders!